Staying awake while trucking is essential for your safety and the safety of those around you! Trucking requires you to be on the road for long hours at a time. It is important to be awake and lively while taking these trips because you don’t want to endanger yourself or anyone else on the road. Falling asleep while trucking is simply not an option because it could cause a bad accident. Here are some tips for truck drivers on how to stay awake on the road. If you know you are about to get on the road for the day, take a twenty-minute power nap beforehand. These naps are short enough that you will wake up in time, but also long enough to give you the energy you need to get on the road. Take a ten-minute walk when you wake up from your nap to get your body moving and wake yourself up. On the day of your drive, take one or two power naps so that you can be ready. When it is time for a road trip, a lot of us want to drink coffee and eat things like candy and fast food. Though they might give you a temporary sugar rush, these types of foods are not good for your energy in the long run. Junk food will not only make you sleepy after the sugar wears off, but it could also upset your stomach which will make it uncomfortable to drive. You want to eat a meal with plenty of protein and vegetables. The nutrients found in healthy foods help to keep you energized throughout your trucking venture. It is always good to provide yourself with some background noise while you are trucking. Silence can lead to you getting sleepy because there is nothing to distract you. If you are a person who likes music, turn on your favorite tunes to get you through your trip. Another good idea is to listen to an interesting podcast or even an audiobook. These are things that will keep you focused and alert because you want to hear what is going to happen next. You do not need to take your trucking trip all at once. It is perfectly fine to take breaks in between time to take a quick nap or just stretch your legs out. Something as simple as getting out to go to the restroom can give you an energy boost. There are plenty of truck stops and rest areas along the highways so that you can park your truck and get out of it for a little while. While the heat may keep it nice and cozy in your truck, the last thing you want to be is cozy. 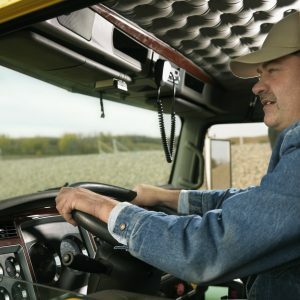 You don’t want to get too comfortable while trucking because that could make you start to get sleepy. It is better to turn the heat down to a point where you are actually a little uncomfortable. This will ensure that your body doesn’t relax, therefore keeping you awake. Whether you need new parts for you truck or are simply interested in the latest trucking technology, you can rely on Baltimore Freightliner-Western Star. We have provided top-notch service for the trucking industry for 30 years and would love to assist you in buying a new top-of-the-line truck, finding the specialty parts you need, or repairing your truck. Give us a call toll-free at 800-832-7278 or locally at 410-685-4474, or contact us online. To find out more about what we are up to, follow us on Facebook, Twitter, Pinterest, and Google+. This entry was posted on Friday, February 16th, 2018	at 7:43 pm	and is filed under Trucking Lifestyle	. You can follow any responses to this entry through the RSS 2.0	feed. Both comments and pings are currently closed.